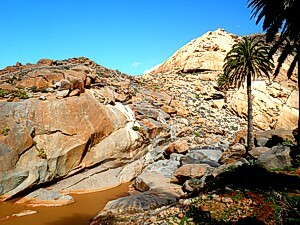 Penitas Ravine, Gullies in Fuerteventura. 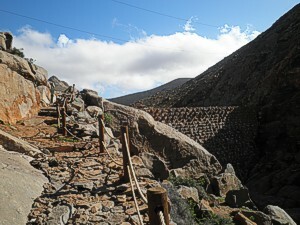 Treeking routes in Canary Island. The Barranco de las Penitas (Penitas Ravine) is one of the most interesting natural areas of Fuerteventura, and for me one of the 4 most beautiful places on the island, and includes a small space a large number of attractions that makes it obligatory to visit, although "the great unknown of the island. " Besides being a very nice area, also has one of the few water reservoirs that exist in the island, has a path through it safely from Vega de Rio Palmas to Buen paso, and also find the small chapel of the patron saint of Fuerteventura, the Virgin of the Rock , where there is a pilgrimage every year. If we make the tour of this area from the south (from Buen Paso towards Vega de Rio Palmas), the first thing we find is a group of giant palm trees (looks like a Oasis), some of them sick, so they are being treated by the council for recovery. From this small forest, we take the path that runs through the gorge by the side of the left, or we can cross the ravine on track, although there are some areas of difficult access. 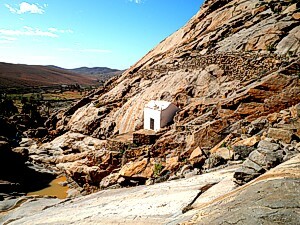 The Chapel of the Virgen de la Peña, is accessed from the trail above and is more or less in the middle of the ravine. 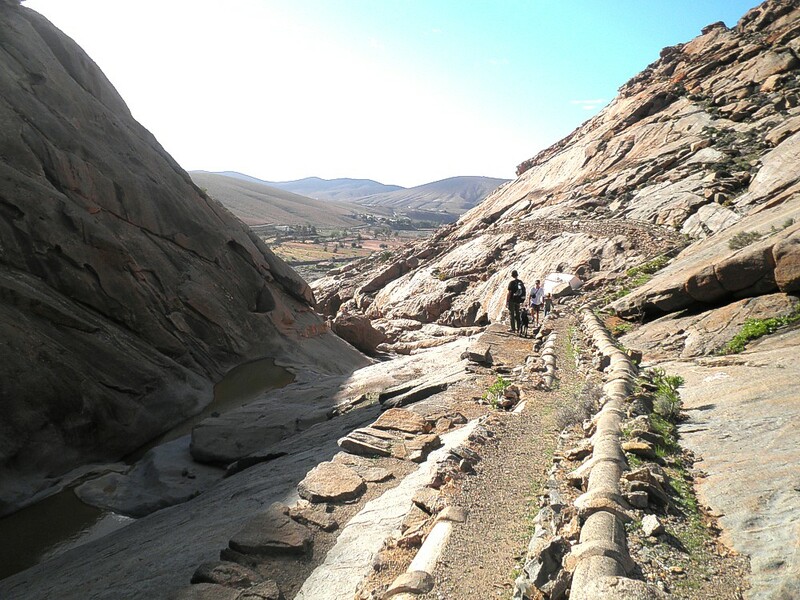 At the end of the gorge are the Penitas dam, built after the Spanish Civil War, and is now wasted because it is filled with sediments that have accumulated over the years, so it just collects water. This area is one of the best for climbing, so it is common to see climbers in this area in the sport. 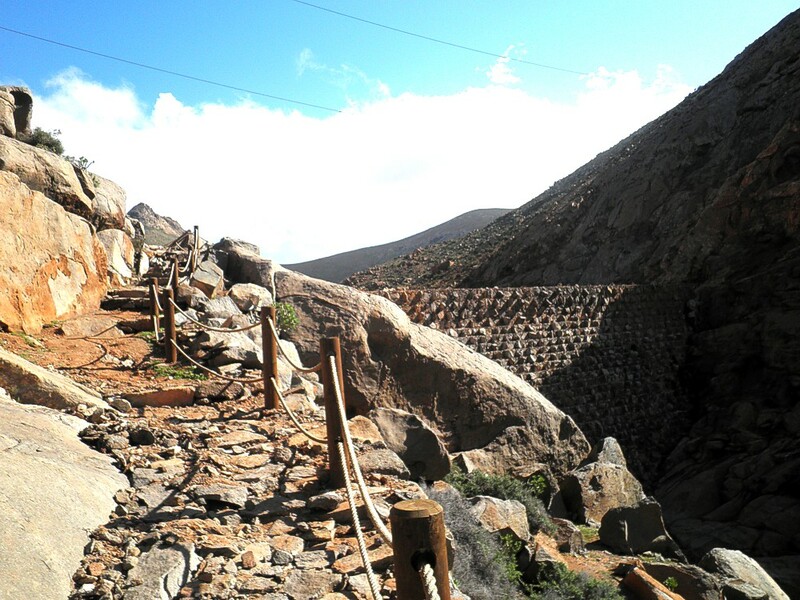 The entire route of this ravine is part of one of the most interesting trails Fuerteventura, which runs from Vega de Rio Palmas to Ajuy. This is one of the most attractive of Fuerteventura, and its route is simple, without long distances or steep slopes, making it suitable for almost everyone, with appropriate precautions.